Katz's Marina is a full service marina and has been restoring, building and maintaining antique wooden boats for many years. We are proud to offer a large selection of wooden boats for sale. Katz's Marina is the #1 antique boat dealer in the world with a selection of over 100 Chris Craft, Gar Wood, Century and Higgins antique boats in stock. We are the only antique boat dealer with a one year warranty on boat sales. Browse our large selection of wooden boats for sale. We also offer boats repairs, preventative maintenance and refinishing services. We carry a large assortment of parts and accessories for antique and classic boats. We are located on the largest lake in New Jersey, Lake Hopatcong. We are a full service marina offering dock slips, boat repairs on all makes and models, boat storage, marine repairs, pump out services, travel lifts, dry dock, bath house and a well-stocked ship's store. Whether you're new to the boating world or an avid boater, we provide all services to take care of your boat. 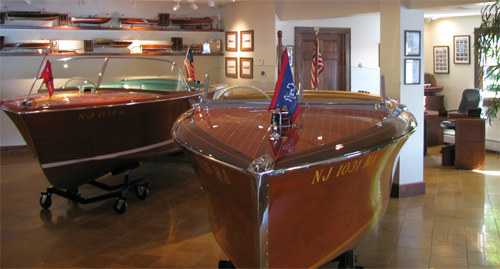 Stop by our Marina to see our Extensive Collection of Wooden Boats for Sale!